The following report was compiled by the U.S. Strategic Bombing Survey convened during the Roosevelt administration to analyze strategic bombing in both the European and Pacific campaigns during World War II. The following report from 1946 on the atomic bombings of Hiroshima and Nagasaki is held at the Harry S. Truman Library and Museum. A more legible version of the report from a later printing is also available online from the Roger Williams University Library. The available facts about the power of the atomic bomb as a military weapon lie in the story of what it did at Hiroshima and Nagasaki. Many of these facts have been published, in official and unofficial form, but mingled with distortions or errors. 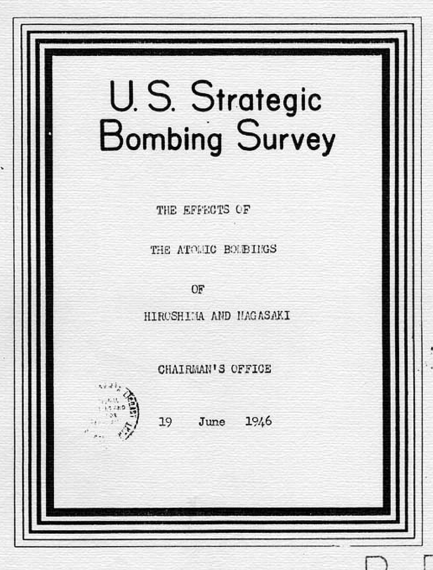 The U.S. Strategic Bombing Survey, therefore, in partial fulfillment of the mission for which it was established, has put together in these pages a fairly full account of just what the atomic bombs did at Hiroshima and Nagasaki. Together with an explanation of how the bomb achieved these effects, this report states the extent and nature of the damage, the casualties, and the political repercussions from the two attacks. The basis is the observation, measurement, and analysis of the Survey’s investigators. The conjecture that is necessary for understanding of complex phenomena and for applying the findings to the problems of defense of the U.S. is clearly labeled. When the atomic bombs fell, the U.S. Strategic Bombing Survey was completing a study of the effects of strategic bombing on Germany’s ability and will to resist. A similar study of the effects of strategic bombing on Japan was being planned. The news of the dropping of the atomic bomb gave a new urgency to this project, for a study of the air war against Japan clearly involved new weapons and new possibilities of concentration of attack that might qualify the effectiveness of air power. The directors of the Survey, therefore, decided to examine exhaustively the effects of the atomic bombs, in order that the full impact on Japan and the implications of their results could be confidently analyzed. Teams of experts were selected to study the scenes of the bombings from the special points of emphasis of physical damage, civilian defense, morale, casualties, community life, utilities and transportation, various industries, and the general economic and political repercussions. In all, more than 110 men – engineers, architects, fire experts, economists, doctors, photographers, draftsmen – participated in the field study at each city, over a period of ten weeks from October to December, 1945. Their detailed studies, now being published, are listed in an appendix to this summary report. Special acknowledgement is due to the medical groups of the Joint Commission, whose data and findings have been generously made available to the Survey. On medical aspects of the bombings, the Joint Commission was the chief fact-finding group; it will present its definitive report in the near future. In other fields, however — particularly the study of physical damage and the impact on community life — the Survey collected its own data and is the primary source. A single atomic bomb, the first weapon of its type ever used against a target, exploded over the city of Hiroshima at 0815 on the morning of 6 August 1945. Most of the industrial workers had already reported to work, but many workers were enroute and nearly all the school children and some industrial employees were at work in the open on the program of building removal to provide firebreaks and disperse valuables to the country. The attack came 45 minutes after the “all clear” had been sounded from a previous alert. Because of the lack of warning and the populace’s indifference to small groups of planes, the explosion came as an almost complete surprise, and the people had not taken shelter. Many were caught in the open, and most of the rest in flimsily constructed homes or commercial establishments. The bomb exploded slightly northwest of the center of the city. Because of this accuracy and the flat terrain and circular shape of the city, Hiroshima was uniformly and extensively devastated. Practically the entire densely or moderately built-up portion of the city was leveled by blast and swept by fire. A “fire-storm”, a phenomenon which has occurred infrequently in other conflagrations, developed in Hiroshima: fires springing up almost simultaneously over the wide flat area around the center of the city drew in air from all directions. The inrush of air easily overcame the natural ground wind, which had a maximum velocity of 30 to 40 miles per hour two to three hours after the explosion. The “fire-wind” and the symmetry of the built-up center of the city gave a roughly circular shape to the 4.4 square miles which were almost completely burned out. The surprise, the collapse of many buildings, and the conflagration contributed to an unprecedented casualty rate. Seventy to eighty thousand people were killed, or missing and presumed dead, and an equal number were injured. The magnitude of casualties is set in relief by a comparison with the Tokyo fire raid of 9/10 March 1945, in which, though nearly 16 square miles were destroyed, the number killed was no larger and fewer people were injured. The city remained on the warning alert, but when two B-29’s were again sighted coming in the raid signal was not given immediately; the bomb was dropped at 1102 and the raid signal was given a few minutes later, at 1109. Thus only about 400 people were in the city’s tunnel shelters, which were adequate for about 30 per cent of the population. In Nagasaki, no fire storm arose, and the uneven terrain of the city confined the maximum intensity of damage to the valley over which the bomb exploded. The area of nearly complete devastation was thus much smaller: only about 1.8 square miles. Casualties were lower also; between 35,000 and 40,000 were killed, and about the same number injured. People in the tunnel shelters escaped injury, unless exposed in the entrance shaft. The city of Hiroshima is located on the broad fan-shaped delta of the Ota River, whose seven mouths divide the city into six islands which project finger-like into Hiroshima Bay of the Inland Sea. These mouths of the river furnished excellent firebreaks in a city that is otherwise flat and only slightly above sea level. A highly developed bridge system with 81 important bridges, joined the islands. A single kidney shaped hill in the eastern part of the city, about one-half mile long and rising to an elevation of 221 feet, offered some blast protection to structures on the eastern side opposite the point of fall of the bomb. Otherwise, the city was uniformly exposed to the spreading energy from the bomb. The city boundary extends to some low hills to the west and northeast and embraces 26.36 square miles, only thirteen of which were built up. Seven square miles were densely or moderately built up, the remainder being occupied by sparsely built-up residential, storage, hilly sections. In the central area, no systematic separation of commercial, industrial, and residential zones existed, though there were rough functional sections. The main commercial district was located in the center of the city, and with the adjoining Chugoku Regional Army Headquarters occupied the greater portion of the central island. Residential areas and military barracks overlapped and surrounded this central area. The bulk of the industries were located on the perimeter of the city, either on the southern ends of the islands (where the Hiroshima airport was also situated) or to the east of the city. The residential, commercial, and military — contained 75 percent of the total population. If there were, as seems probable, about 245,000 people in the city at the time of the attack, the density in the congested area must have been about 46,000 per square mile. Five completed evacuation programs and a sixth then in progress had reduced the population from its wartime peak of 380,000. Other buildings, however, were constructed far more strongly than is required by normal building codes in America, to resist earthquakes. Furthermore, construction regulations in Japan have specified since the 1923 earthquake that the roof must safely carry a minimum load of 70 pounds per square foot whereas American requirements do not normally exceed 40 pounds per square foot for similar types. Though the regulation was not always followed, this extra strong construction was encountered in some of the buildings near ground zero at Hiroshima, and undoubtedly accounts for their ability to withstand atomic bomb pressures without structural failures. Nearly 7 percent of the residential units had been torn down to make firebreaks. Hiroshima before the war was the seventh largest city in Japan, with a population of over 340,000, and was the principal administrative and commercial center of the southwestern part of the country. As the headquarters of the Second Army and of the Chugoku Regional Army, it was one of the most important military command stations in Japan, the site of one of the largest military supply depots, and the foremost military shipping point for both troops and supplies. Its shipping activities had virtually ceased by the time of the attack, however, because of sinkings and the mining of the Inland Sea. It had been relatively unimportant industrially before the war, ranking only significance. These factories were not concentrated, but spread over the outskirts of the city; this location, we shall see, accounts for the slight industrial damage. The impact of the atomic bomb shattered the normal fabric of community life and disrupted the organizations for handling the disaster. In the 30 percent of the population killed and the additional 30 percent seriously injured were included corresponding proportions of the civic authorities and rescue groups. A mass flight from the city took place, as persons sought safety from the conflagration and a place for shelter and food. Within 24 hours, however, people were streaming back by the thousands in search of relatives and friends and to determine the extent of their property loss. Road blocks had to be set up along all routes leading into the city, to keep curious and unauthorized people out. The bulk of the dehoused population found refuge in the surrounding countryside; within the city the food supply was short and shelter virtually non-existent. On August 7, the commander of the Second Army assumed general command of the counter-measures, and all military units and facilities in the area were mobilized for relief purposes. Army buildings on the periphery of the city provided shelter and emergency hospital space, and dispersed Army supplies supplemented the slight amounts of food and clothing that had escaped destruction. The need far exceeded what could be made available. Surviving civilians assisted; although casualties in both groups had been heavy, 190 policemen and over 2000 members of the Civilian Defense Corps reported for duty on 7 August. Army hospitals were rendered unusable. Those within 3,000 feet of ground zero were totally destroyed, and the mortality rate of the occupants was practically 100 percent. Two large hospitals of reinforced concrete construction were located 4,900 feet from ground zero. The basic structures remained erect but there was such severe interior damage that neither was able to resume operation as a hospital for sometime and the casualty rate was approximately 90 percent, due primarily to falling plaster, flying glass, and fire. Hospitals and clinics beyond 7,000 feet, though often remaining standing, were badly damaged and contained many casualties from flying glass or other missiles. Effective medical help had to be sent in from the outside, and arrived only after a considerable delay. Fire fighting and rescue units were equally stripped of men and equipment. Father Siemes reports that 30 hours elapsed before any organized rescue parties were observed. In Hiroshima, only 16 pieces of fire-fighting equipment were available for fighting the conflagration, three of them borrowed. However, it is unlikely that any public fire department in the world, even without damage to equipment or casualties to personnel, could have prevented development of a conflagration in Hiroshima, or combatted it with success at more than a few locations along its perimeter. The total fire damage would not have been much different. All utilities and transportation services were disrupted over varying lengths of time. In most cases, however, the demand fell off even more precipitously than the available supply, and where the service was needed it could be restored at a minimal level. Thus, through railroad service was possible on 8 August, only two days after the attack, when fire trucks still had to be used to pump water into the locomotives because of insufficient water pressure. Electric power from the general network was available in most of the surviving parts of the city on 7 August, and only one plant, the Engineering Division of Mitsubishi Heavy Industries, was hampered in its recovery by the inability to obtain sufficient power for several weeks. The water reservoir, which was of reinforced concrete and earthcovered, was undamaged; it was nearly two miles from the blast center. However, 70,000 breaks of pipe connections in buildings and dwellings were caused by blast and fire effects. No subsurface pipes were crushed and no leaks resulted from blast as a direct cause, though several leaks in underground mains resulted from falling debris. Pressure in the city center dropped to zero because of the connection breaks and the damage to a 16-inch and a 14- inch water main where they crossed damaged bridges. Six sewer pumping stations were rendered inoperable by fire and blast within a radius of one mile. The remaining eight stations were only slightly damaged, but no effort was made to repair or operate them. Water tables rose at flood periods and lands behind revetments were inundated. Industry in the center of the city was effectively wiped out. Though small workshops numbered several thousand, they represented only one- fourth of the total industrial production of Hiroshima, since many of them had only one or two workers. The bulk of the city’s output came from large plants located on the outskirts of the city: one-half of the industrial production came from only five firms. Of these larger companies, only one suffered more than superficial damage. Of their working force, 94 percent were uninjured. Since electric power was available, and materials and working force were not destroyed, plants ordinarily responsible for nearly three-fourths of Hiroshima’s industrial production could have resumed normal operation within 30 days of the attack had the war continued. Immediately after the attack, the presence of these nearly intact industries spurred counter-measures in an effort to retain for the nation’s war effort the potential output of the city. The prefectural governor issued a proclamation on 7 August, calling for “a rehabilitation of the stricken city and an aroused fighting spirit to exterminate the devilish Americans”. To prevent the spread of rumors and brace morale, 210,000 out-of-town newspapers were brought in daily to replace the destroyed local paper. On 16 August, regular rationing was resumed. Care of the injured and disposal of corpses remained urgent, but other steps were few. 62,000 out of a total of 90,000 buildings in the urban area, or 69%. An additional 6,000 or 6.6% were severely damaged, and most of the others showed glass breakage or disturbance of roof tile. These figures show the magnitude of the problem facing the survivors. Despite the absence of sanitation measures, no epidemics are reported to have broken out. In view of the lack of medical facilities, supplies and personnel, and the disruption of the sanitary system, the escape from epidemics may seem surprising. The experience of other bombed cities in Germany and Japan shows that this is not an isolated case. A possible explanation may lie in the disinfecting action of the extensive fires. In later weeks, disease rates rose, but not sharply. Nagasaki is located on the best natural harbor of western Kyushu, a spacious inlet in the mountainous coast. The city is a highly congested urban pattern extending for several miles along the narrow shores and up the valleys opening out from the harbor. Two rivers, divided by a mountain spur, form the two main valleys in whose basins the city lies: the Urakami River, in whose basin the atomic bomb fell, running into the harbor from a NNW direction, and the Nakashima River, running from the NE. This mountain spur and the irregular lay-out of the city effectively reduced the area of destruction. The main residential and commercial districts are intermingled in these two river basins. The large industrial plants stretch up the west shore of the bay and up the Urakami Valley. Though the metropolitan area of the city is officially about 35 square miles and stretches far into the countryside, the heavily built-up area is confined by the terrain to less than four square miles. The greatest population density thus approximated 65,000 per square mile even after the evacuations. Despite its excellent harbor, Nagasaki’s commercial importance, though great in previous centuries, had declined in recent years because of the city’s isolated peninsular position and the difficulties of transportation through the mountains by inadequate roads and railroad facilities. As a naval base it had been supplanted by Sasebo. Industry gradually increased in importance, primarily under Mitsubishi influence. The four largest companies in the city were the Mitsubishi Shipyards, Electrical Equipment Works, Arms Plant, and Steel Works, employing nearly 90 percent of the city’s labor force. Administratively, Nagasaki was by 1941 of merely local importance despite being the seat of the prefectural government. Before the atomic bombing on 9 August, Nagasaki had experienced five small-scale air attacks in the previous twelve months, by an aggregate of 136 planes which dropped a total of 270 tons of high explosive, 53 tons of incendiary, and 20 tons of fragmentation bombs. Because the most intense destruction was confined to the Urakami Valley, the impact of the bomb on the city as a whole was less shattering than at Hiroshima. In addition, no fire storm occurred; indeed, a shift in wind direction helped control the fires. Medical personnel and facilities were hard-hit, however. Over 80 percent of the city’s hospital beds and the Medical College were located within 3,000 feet of the center of the explosion, and were completely destroyed. Reinforced concrete buildings within this range, though standing, were completely gutted by fire; buildings of wooden construction were destroyed by fire and blast. The mortality rate in this group of buildings was between 75 and 80 percent. Exact casualty figures for medical personnel are unknown, but the city seems to have fared better than Hiroshima: 120 doctors were at work on 1 November, about one-half of the pre-raid roster. Casualties were undoubtedly high: 600 out of 850 medical students at the Nagasaki Medical College were killed and most of the others injured; and of the 20 faculty members 12 were killed and four others injured. Utilities and services were again disrupted. Both gas plants were destroyed, and the replacement time was estimated at several months. Though the basic water supply was not affected, thousands of residential feeder-line breaks were supplemented by eight breaks on a fourteen-inch main line and four breaks where another main line crossed a bridge. Electric power distribution and transmission systems were effectively destroyed in the area of heaviest destruction, but power could be supplied to the other parts of the city almost immediately. Shipping was virtually unaffected. Trolley service was halted both by the interruption in power supply and by damage to street cars. Nagasaki is at the end of a railroad spur line. The major damage was sustained by track and railroad bridges. The rails buckled intermittently for a distance of 5,000 to 7,500 feet from ground zero, at points where burning debris set fire to wooden cross ties. Three bridges were displaced; rails were distorted and the tracks had to be completely rebuilt. The railroad stations were completely destroyed by blast and fire and the electric signal system was severely damaged. Rolling stock was slightly damaged, primarily by fire. Although the damage to equipment was not extensive, it was severe enough to curtail traffic for 48 hours, during which time sufficient emergency repair work was performed to permit resumption of limited traffic. Control of relief measures was in the hands of the Prefecture. The sequence of clearance and repair activities illustrates the activities that were carried on. The city’s repair facilities were completely disorganized by the atomic bomb, so that with the single exception of shutting off water to the affected areas no repairs were made to roads, bridges, water mains, or transportation installations by city forces. The prefecture took full responsibility for such restoration as was accomplished, delegating to the scattered city help the task of assisting in relief of victims. There were only three survivors of 115 employees of the street car company, and late as the middle of November 1945 no cars were running. A week after the explosion, the water works officials made an effort to supply water to persons attempting to live in the bombed out areas, but the leakage was so great that the effort was abandoned. It fell to the prefecture, therefore, to institute recovery measures even in those streets normally the responsibility of the city. Of the entire public works construction group covering the Nagasaki City area, only three members appeared for work and a week was required to locate and notify other survivors. On the morning of 10 August, police rescue units and workers from the Kawaminami shipbuilding works began the imperative task of clearing the Omura-Nagasaki pike, which was impassable for 8,000 feet. A path 6 1/2 feet wide was cleared despite the intense heat from smouldering fires, and by August 15 had been widened to permit two-way traffic. No trucks, only rakes and shovels, were available for clearing the streets, which were filled with tile, bricks, stone, corrugated iron, machinery, plaster, and stucco. Street areas affected by blast and not by fire were littered with wood. Throughout the devastated area, all wounded had to be carried by stretcher, since no motor vehicles were able to proceed through the cluttered streets for several days. The plan for debris removal required clearance of a few streets leading to the main highway; but there were frequent delays caused by the heat of smoldering fires and by calls for relief work. The debris was simply raked and shoveled off the streets. By 20 August the job was considered complete. The streets were not materially damaged by the bomb nor were the surface or the abutments of the concrete bridges, but many of the wooden bridges were totally or partially destroyed by fire. Under the circumstances — fire, flight of entire families, destruction of official records, mass cremation — identification of dead and the accurate count of casualties was impossible. As at Hiroshima, the season of the year made rapid disposal of bodies imperative, and mass cremation and mass burial were resorted to in the days immediately after attack. Despite the absence of sanitary measures, no epidemics broke out here. The dysentery rate rose from 25/100,000 to 125/100,000. A census taken on 1 November 1945 found a population of 142,700 in the city. “Within a radius of one kilometer from ground zero, men and animals died almost instantaneously from the tremendous blast pressure and heat; houses and other structures were smashed, crushed and scattered; and fires broke out. The strong complex steel members of the structures of the Mitsubishi Steel Works were bent and twisted like jelly and the roofs of the reinforced concrete National Schools were crumpled and collapsed, indicating a force beyond imagination. Trees of all sizes lost their branches or were uprooted or broken off at the trunk. “Outside a radius of one kilometer and within a radius of two kilometers from ground zero, some men and animals died instantly from the great majority were seriously or superficially injured. Houses and other structures were completely destroyed while fires broke out everywhere. Trees were uprooted and withered by the heat. While the conflagration with its uniformly burnt out area caught the attention at Hiroshima, the blast effects, with their resemblance to the aftermath of a hurricane, were most striking at Nagasaki. Concrete buildings had their sides facing the blast stove in like boxes. Long lines of steel framed factory sheds, over a mile from ground zero, leaned their skeletons away from the explosion. Blast resistant objects like telephone poles leaned away from the center of the explosion; on the surrounding hills trees were blown down within considerable areas. Although there was no general conflagration, fires contributed to the total damage in nearly all concrete structures. Evidence of primary fire is more frequent than at Hiroshima. Because parts of the city were protected by hills, more than one-half of the residential units escaped serious damage. Of the 52,000 residential units in the city on 1 August, 14,146 or 27.2 percent were completely destroyed (by Japanese count) (11,494 of these were burned) ; 5,441 or 10.5 percent were half-burned or destroyed; many of the remaining units suffered superficial or minor damage. In 558 non-residential buildings in the built-up area of Nagasaki which the Survey studied, almost 60 percent of the usable floor area was destroyed or structurally damaged. Only 12 percent was undamaged, the rest suffering superficial or minor damage. The survival of a higher percentage of the buildings, then, distinguishes Nagasaki from Hiroshima; so also, on the other hand, does the damage to factories. In Nagasaki, only the Mitsubishi Dockyards among the major industries was remote enough from the explosion to escape serious damage. The other three Mitsubishi firms, which were responsible together with the dockyards for over 90 percent of the industrial output of the city, were seriously damaged. The Arms Plant and the Steel Works were in the main area of damage. Plant officials estimated that 58 percent of the value of the former and 78 percent of the value of the latter were destroyed: Survey investigators considered the two plants to be 50 percent destroyed. The Mitsubishi Electric Works were on the edge of the main area of destruction, but suffered 10 percent structural damage. In general, (as has proved true with high explosive or incendiary bombs also), the damage to machinery and other contents of a factory was less than damage to the buildings. In addition, the air burst of the atomic bomb meant that it acted indirectly on machine tools and other building contents. Though a few tools were blown over by blast, almost all the serious damage was caused by debris from damaged buildings, overturning through mass movement of buildings, or burning of buildings. Thus the extent and sort of damage to machinery depended on the construction of the buildings housing them. In wood frame buildings, 95 percent of the machines were seriously damaged, but in reinforced concrete or steel framed buildings only one-third or one-fourth of the machines were affected seriously. As would be expected, fire caused much damage to machines in timber framed shops (practically all of which were destroyed up to 7,000 feet from ground zero) and some damage in other types of structure. Debris was a major cause of damage only in certain reinforced concrete buildings, where walls and roofs collapsed. Shortage of raw materials had reduced operations at these four Mitsubishi plants to a fraction of their capacity. Had the raw material situation been normal and had the war continued, it is estimated that restoration of production would have been possible though slow. The dockyard, which was affected mainly by the 1 August attack rather than by the atomic bomb, would have been able to produce at 80 percent of full capacity within three or four months. The steel works would have required a year to get into substantial production, the electric works could have resumed production at a reduced rate within two months and been back at capacity within six months, and the arms plants would have required 15 months to reach two-thirds of their former capacity.